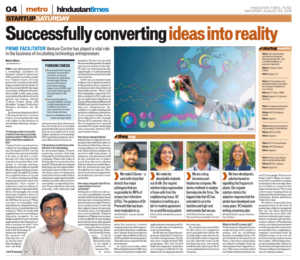 HindsutanTimes published an article “Successfully converting ideas in to reality”on Venture Center projecting how the center is facilitating the startup journeys by providing critical resources. The article also covers the business stories of Biolmed Innovations Pvt Ltd, Shantani Proteome Analytics Pvt Ltd, Module Innovations Pvt. Ltd and Biorpime Agri Solutions Pvt. Ltd.